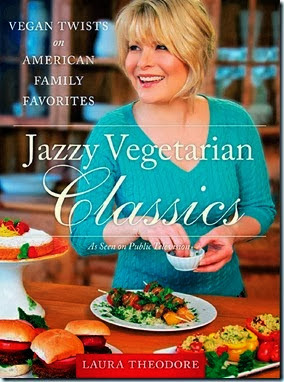 I am very excited to be reviewing Laura Theodore's new book, Jazzy Vegetarian Classics and giving one away. You may know Laura from her PBS cooking show Jazzy Vegetarian, which is now in its third season and can currently be seen on the Create Channel on Tuesdays and Thursdays (See video at bottom of page). For eighteen years, Laura has helped people all over the world to understand the relationship between diet and health and that eating a well-structured plant-based diet can prevent, stop, and even reverse some degenerate diseases. On her television show and in her book, she entices people, regardless of their current eating habits to want to explore new foods and dishes. Her book has a beautiful hardcover, high quality pages and was published September 3, 2013 by BenBella Books. The book is 312 pages and features gorgeous photos throughout. In her introduction she quotes Albert Einstein, "Nothing will benefit human health and increase chances for survival of life on Earth as a much as the evolution to a vegetarian diet." It is written for everyone - from seasoned vegans looking for innovative new dishes, to casual home cooks interested in adding one or two plant-based meals a week to their repertoire. Jazzy Vegetarian Classics includes guides to the basics of vegan cooking coupled with a glossary of common ingredients. I love that she included 10 full menus, besides all of her awesome recipes. For example, All-American Burger and fries (Menu 5) includes: Mushroom-Nut Burgers, Confetti Oven Fries, Pretty Purple Coleslaw, Banana Milk-less Shake and Chewy Chocolate Chip Cookies. Festive Family Meal (Menu 8) includes: Apple, Walnut, and Cinnamon Salad, Sweet and Sour Stuffed Cabbage, Mashed Potatoes with roasted Garlic, Steamed Green Beans & Carrots with Orange Sauce , and Coconut Vegaroons. All of these menus make it very easy to plan for a special day. If you are wondering why Laura is called the Jazzy Vegetarian, it is because she is also a good jazz singer. The bottom of her books pages even include faint piano notes. Her book is of the highest quality to give away at Christmas or any time. I decided to make Laura's Sweet and Sour Stuffed Cabbage, which turned out absolutely fabulous and delicious. The recipe was based on her mother-in-laws traditional family recipe. This is a fabulous holiday or Sunday night meal which I highly recommend! I used leftover brown rice and instead of the canned tomatoes you can use vine ripened tomatoes that have been chopped in quarters and smashed a bit to equal 3 1/2 cups. I received permission to share this yummy recipe with all of you. I hope you enjoy it. Don't forget to enter for the Giveaway. Instructions are at the bottom of the page. Based on my mother-in-law’s traditional family recipe, this dish is totally tasty! The freshly squeezed lemon juice balances beautifully with the brown sugar, making a truly sweet and sour sauce for these hearty, savory stuffed cabbage rolls. A fabulous holiday dish or satisfying weeknight meal! tamari in a medium sauce pan. Cover and simmer over medium-low heat for 5 minutes. simmer for 15 minutes while preparing the cabbage rolls. remaining cabbage for another use. To make the filling, put the brown rice in a large bowl. Put the walnuts in a blender and pulse to process into coarse crumbs. Add the walnuts to the brown rice. Put the bread, all-purpose seasoning, and salt in a blender and process until coarsely ground. Add the bread mixture to the brown rice. Put the mushrooms and 1 cup diced onion in a blender and process into a chunky purée. 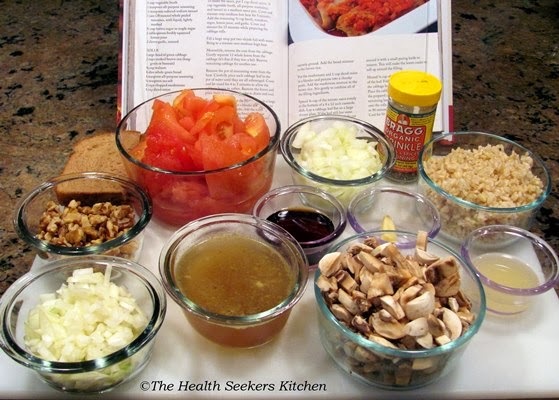 Add the mushroom mixture to the brown rice. Stir gently to combine all of the filling ingredients. Spread ¾ cup of the tomato sauce evenly in the bottom of a 9 x 12 inch casserole dish. Lay a cabbage leaf flat on a large dinner plate. If the leaf still has some of the thick stem attached, carefully cut around it with a small paring knife to remove. This will make the leaves easier to roll up around the filling. Mound ¼ cup of the filling in the center of the leaf. Fold the sides inward and roll the cabbage leaf firmly around the filling. Place the cabbage roll seam-side down in the prepared casserole. Repeat with the remaining leaves. Pour the remaining sauce over the rolls and cover tightly. Bake for 70 to 90 minutes, or until the cabbage is soft. Cool for 10 to 15 minutes before serving. It is VERY easy to enter - just leave a comment after this post and check back in one week to see if you have won. You can also leave a link or your email with your comment where to contact you. Deadline for entering giveaway is December 18th. Drawing will be held on December 19th. Good luck!! Thank you to everyone that added a comment. I wish I could send each one of you a book. Look for the next Giveaway book on January 14th, 2014. Stuffed cabbage is a favorite of mine. This one looks delicious! Can't wait to try it! Looks yummy! My family is new to vegetarian cooking. This cookbook would be a great help. Wow!!! This seriously looks SO amazing!! I will definitely be adding this to my dinner menu! What a fun book! I hope I win!! Thanks for introducing me to this cookbook author! 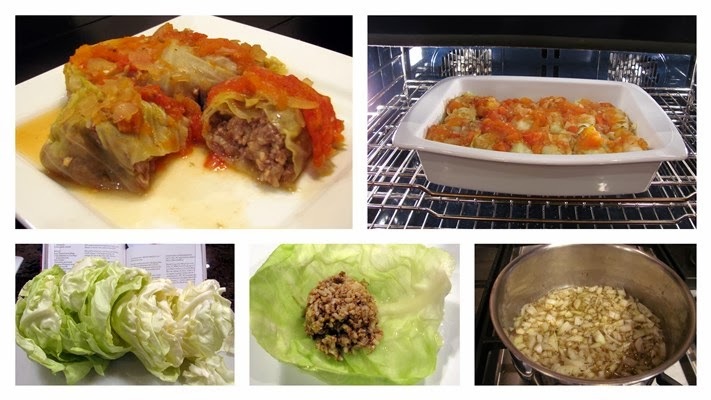 I'll try this stuffed cabbage soon! And thank you for the giveaway! Looks delicious! Would love to serve this recipe to my friends! This looks fabulous! I do love her recipes and will try this tomorrow.